The Masterbuilt Butterball Indoor Fryer is an indoor machine. You can see the fryer’s sleek, considerable thought, modern look that has gone into its styling. The power of the fryer is 1650 watts. So it can get the oil heat up very quickly. There is a thermal control to manage cooking. It has an auto control option to prevent oil from going beyond the maximum level. So many quality Butterball turkey fryers available here, just read the article on Butterball turkey fryer reviews and find which one is best for you. There is an analog control panel to the heating panel. You can remove it from the main body. You need to turn the dial to adjust time. For Frying Turkey you need to set temperature 375 degrees F. when the temperature reaches to the level the ready-light lights up. Now you slowly lower Turkey. You need to adjust time by pushing the timer button to get your expected settings. After releasing the button and then timing started. Moreover, there is also a thermostat temperature control. This controller can maintain temperature up to 375-degree F. when the temperature reaches the optimum level the indicator light lights up once. Turkey is one of the most favorite food of American people in the various occasion and especially on the Thanksgiving day. However, this turkey bird can be cooked in indoor with a turkey fryer, and it’s completely safe. This figure shows how Turkey is getting famous day by day and how people consume it. In early 1970 it was 8.1 lbs/person in lunch/dinner table, and 16 pounds/person now increases that in 2015. This also shows day by day eating turkey is increasing. People lives in America are very concern about their food and safety. So the main advantage of turkey fryer is safe, and that’s because people are cooking a turkey in their regular holidays also. Finally, it seems people’s love turkey and in future using turkey fryer must increase due to its features and benefits. And not only for the turkey but to make other deep fried food. There is an auto turn off the system with the device. So the machine turns off when the temperature reaches too high. If you use high temperature to boil the oil, it may cause a fire. In such case shut down the unit and reset the temperature again. At first, unplug the unit. You will view a tiny hole at the side of the control panel. You can use a toothpick to reset it. There is a digital timer that you minimize the overcooking for fried birds. The Butterball Indoor Electric Turkey Fryer is a favorite fryer for lots of people. There is no objection against the deep fried turkey. There are some stories of fries, and the near misses discourage the biggest turkey fan. The Butterball Indoor Electric Turkey Fryer is designed well. It is also safe enough to use in the houses. So you can enjoy the usefulness of turkey in your house anytime. The Butterball features are designed well to offer safety for the users. The porcelain-coated inner pot can reserve oil for a long time, and it can save 33% oil than the conventional turkey fryer. You may read the user manual from here. Capacity to fry Turkey up to twenty pounds. In the aluminum cooking basket along with drain clip. 1650 watt electric heating element heats rapidly. It can cook turkeys and chickens smoothly and browns well. It’s very helpful to cook food for big families. Very useful for various kinds of foods without having them personally. Reserve heat in the oil for a long time to cook food for your required time. Big enough so take big place to preserve or keep it. The lid heating cabinet is a must to set on most kitchens. The Masterbuilt Butterball Oil-Free Electric Turkey Roaster is made to offer healthier foods. For the health conscious people, the standard of the fryer has been upgraded. The oil-free roaster offers you perfect moist meat as well as tender-crisp. It looks, and the taste is like fried turkey. There will be no oil on the food. The roadster uses enough heat to set the food outside of turkey. The inner side of the food is moist, and the outer side of the food is crispy. So thank the Masterbuilt, as it can cook 18 pounds only spending ten minutes per pound, or near about 3 hours. Double wall construction applies radiant heat to stick exterior of the turkey. Size: 18 x 23.2 x 26.2 inches (W x H x D); 90 days limited guarantee. The Butterball XXL Digital 22 lb fryer is designed with a digital temperature control and a timer. It will take a little time to cook you the bird. You can make food with crispy skin. You do not need any cooking place so that you can set your sides. Within a short time, you can cook food for your family having many members. You need not spend the whole day in the kitchen. The XXL fryer can cook 22 pounds only spending less than an hour. So you can spend this time by doing other activities. It takes one-third of less oil than the traditional fryers. It makes your food tastier and cost-effective. The cleaning process is very easy. There is a drain valve which empties oil. The inner pot has a porcelain coating for easy cleaning. You can do it for other days with holidays. This is an indoor fryer; therefore, you can use it anytime in anywhere. The answer to this question is tricky for some reason. A turkey is kept in a holder or a basket and keep in a heat source. The heat is fixed here. Therefore, the turkey can cook very quickly than an oven. It will take only 20 minutes to cook a pound of food. Here is some given time to cook a turkey in the turkey fryer. Oil becomes heat up within 3.5 minutes/pound. Cook turkey in a turkey fryer is faster than cooking a turkey in a traditional oven. The four kinds of turkey fryers are very common in the market today. There is a drain valve which helps to remove the oil and helps to clean the fryer easily. To do this, there is a spout attachment. There is a one-piece lid to clean unit better. The indoor electric Butterball turkey fryer by the help of Masterbuilt offers you safety wat to fry your turkey at home. At the time of lifting, hook uses stainless steel basket at the time of lowering the hot oil. It will save getting scalded by the hot oil. Keep your turkey to the defrost temperature, be sure there is no moisture on your turkey. Along with there is no crystals inside of your turkey. Hot oil and water are a dangerous combination and caught fair easily. To get the crispy skin, you need to submerge the whole bird in the boiling oil. In a 14-pound bird, there is a huge capacity fryer will complete something skin outside the level. The parts have a nice crisp. One of the customers said that you need to lower the basket into the hot oil to make a coat with the fryer. Then keep the raw foods inside the basket to lower the boiling oil. What can be cooked with Butterball turkey? To cook a piece of turkey breast, the temperature and time will be different. You need to set temperature 375-degree F.
It will take 7 minutes to cook per pound of food. When you keep the breast meat in the hot oil, you need to reduce the temperature to 325-degrees F. for the cooking process you need to set the lowest temperature. What Else is Critical When Selecting a Turkey Fryer? If you consider the safety features and capabilities of the fryer, you must buy the turkey fryer no doubt. You need to consider the other things if you like to purchase the turkey fire for your situation. With the ability of the fryer, you can cook the maximum size turkey. The outdoor unit has the capacity up to 30 quarts that a bird can handle only 19 pounds. The indoor unit can fry only 10 quarts and can cook the turkey up to 15 kg. 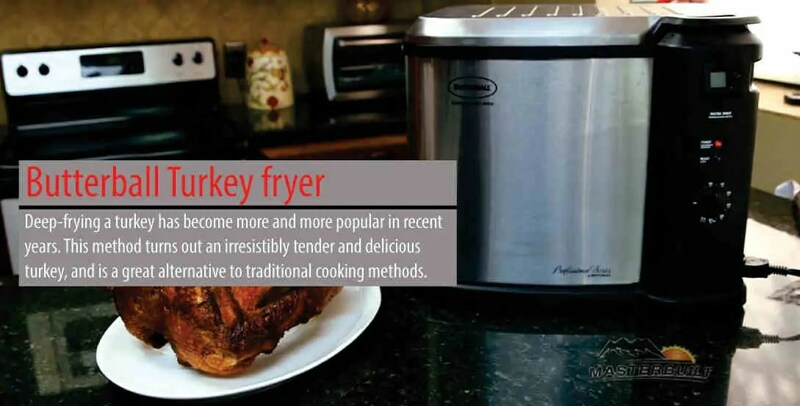 Some turkey fryers come with some unique features, and they are simple to use. Some products have a thermostat, a timer, a drain valve and an indicator. The outdoor units have fewer features than the electric units. There are some outdoor units which have whistles and bells. Turkey frying may be very dangerous since you are working with a great deal of hot oil, but a lot of turkey fryers are outfitted with features that enhance their security. We seemed to see whether every unit had an automobile shut-off, a vented lid, a lifter to assist eliminate the turkey after ingestion it, a cooking jar plus a rack. Most turkey fryers are going to have a number of those attributes, although the top will have them all. The most critical security feature, you should find at a turkey fryer is a car shut-off feature, which prevents it from overheating and potentially resulting in a fire and harms. Which Butterball Turkey Fryer is Best? Crispier Skin Care is created using all the Butterball Turkey Fryer which utilizes petroleum. Gravey could be produced out of Butterball Turkey Fryer that’s oil less. Turkeys are cooked quicker in the Butterball Turkey Fryer which utilizes petroleum. Butterball Turkey Fryer oil less is a great deal safer. These are a few of the big comparisons between the 2 kinds of Butterball Turkey Fryers. Picking the one which is right for you will depend on your requirements. Question: Why my turkey fryer won’t turn on? Answer: There is a safety switch with the fryer that must be mounted to power on. If the control panel is mounted accurately, the power light will have lit up. Question: How much oil need? Answer: Fryer needs 2.75 gallons of oil max. the max fill is the top level of the liquid. You can use it safely. Stretching to the line is more than enough water or oil to serve maximum food in this. Question: What kind of oil can you use? Answer: Peanut oil is suggested to use as the oil has the capacity of higher smoke and great taste. You can also use other cooking oil for this purpose. Question: How much the oil become heat? Answer: The temperature will reach to 375-degrees F within 45 minutes. When you keep the turkey in the fryer, the temperature will be less. Follow the manual to set time. Question: At the time of use can I add lid? Answer: Yes, the lid will help to retain heat, and holds splatter inside of the unit. Question: How much turkey can I plunge to the fry? Answer: Suggested Turkey is A 14-18lb (6.35-8.16kgs). However, you may fry deep up to the 20 lb (9.07kgs) turkey into this unit. Never go beyond 20 lbs (9.07kgs). Mix cayenne pepper, ¾ of the Italian dressing, Creole seasoning, garlic powder and black pepper in a standard bowl. Rinse the mix on the outside of the turkey. Apply the rest of ¼ of the Italian dressing to cover up turkey cavity. Preserve it in a refrigerator for eight hours or the whole night. Take out from the refrigerator and deep fry according to the instructions of the Indoor Butterball Turkey Fryer Manual. Keep oil in a deep fryer and raise heat up to 375 degrees F.
Mix well vegetable and egg-milk in a bowl until it becomes smooth well. Stir in pancake mix as long as there is no lump. Plunge the chocolate cookies into the batter one altogether to make coat completely. Keep the cookies on the fryer with great care at a time. Fry for sometimes to avoid sticking altogether. Fry up to about two minutes or as long as the outside becomes golden brown. Use the basket or tongs to remove it from the oil. Put it on the plate with a paper towel to remove oil or cool the cookies before eating. The Butterball Indoor Electric Turkey Fryer is a popular unit for the users. The indoor of the turkey fryer is very safe. You can enjoy it anytime in your kitchen. The design of the fryer is safe for the users. In the container, you can safely keep the oil. It saves the using of oil more than 33% than the conventional oven. You can cook 14 pounds of turkey safely with the Turkey fryer. The XL size can accommodate 20-pound turkey. So you can prefer the Turkey fryer for your kitchen. The inner part of the fryer is stainless steel. The size of the fryer sometimes discourages the users to use it. But this is not a factor at all to use it. Buy butterball turkey fryer, NOW!